Thanksgiving is just around the corner and to enjoy the feasting day, it’s important to stop and create a game plan for your table! We hang our hat on keeping it simple and modern — and keeping it natural. Here’s our five best tips to doing just that. We love a dark wood table — or black one for that matter — but wherever you’re gathering, start by clearing it off. If you have a nearby sideboard or bar cart, do the same. Think minimal. Minimal does not mean cold or stark, it just draws attention to what you truly love and the look you’re going for. 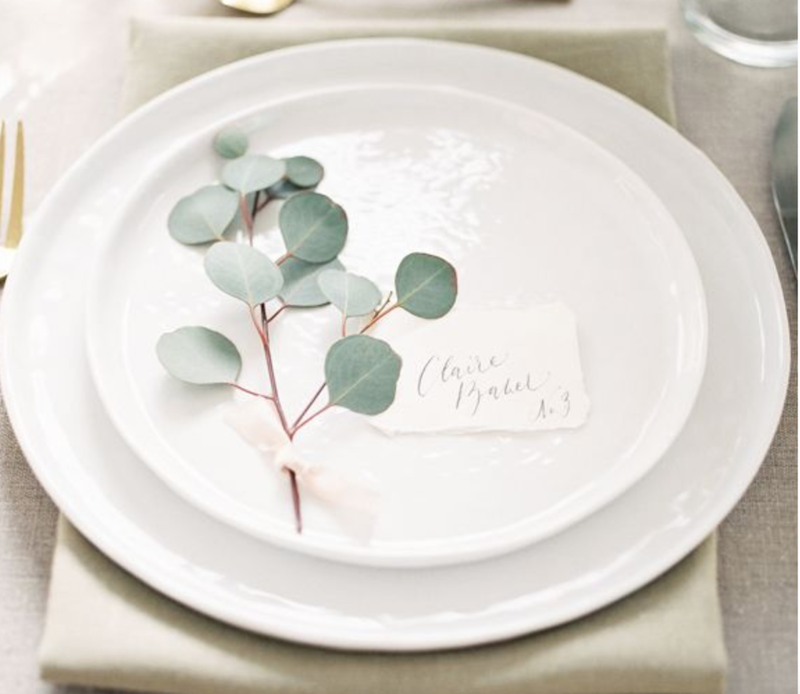 Begin by placing some eucalyptus or other greens (magnolia leaves from the yard are beautiful!) along the table for a base. We love the look of tables set with white and green pumpkins, mixed with eucalyptus (Note: Trader Joe’s is the best local source for bunches of eucalyptus and unscented, white candles!). Don’t worry about being perfect, just start layering in the greens and add in textured items — imperfect beauty is what we’re going for here. Try adding some pumpkins, pears, artichokes or even figs, the unexpected is fun! Next, add in a pop of color. We love the idea of color being brass in your centerpiece by adding some candlesticks and in your flatware! Wood is another great way to layer colors and textures and these are our go-to wood candlesticks and candelabras right now, they add shape and personality! Another way to mix up the color (and height!) is with small bunches of flowers. We were drawn to the mix of bright fuschias in the flowers pictured here — and cut pomegranates. Unexpected again and naturally beautiful. Before you dish up the meal, it’s important to think about the shapes and colors of your serving dishes — and plates! We are in love with these handmade chargers by Aronson Wood Works. 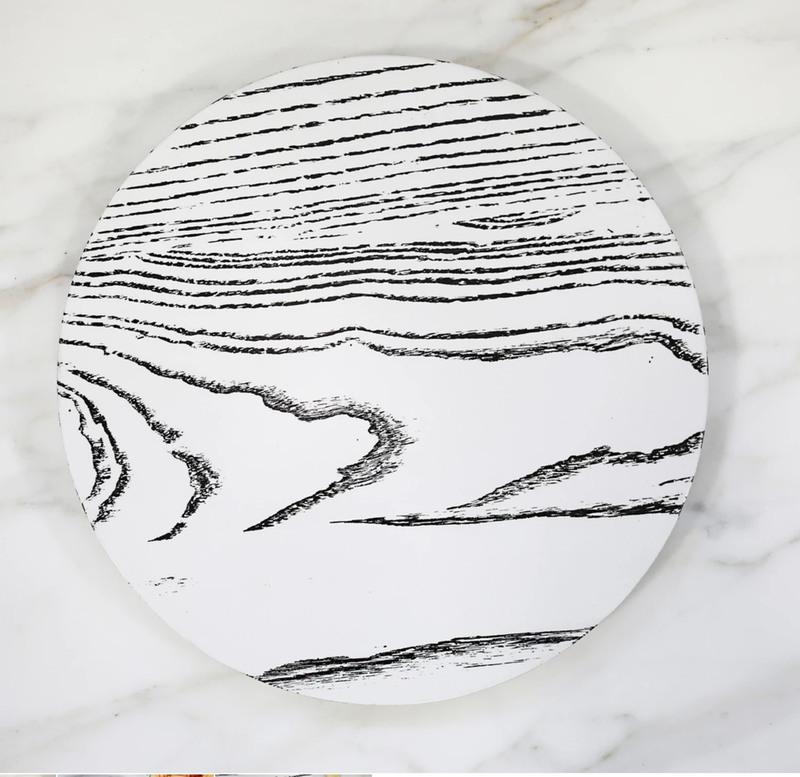 They modernize and protect your table and are easy to wipe off versus a textile that covers your entire table! Easy set up and clean up for the win! 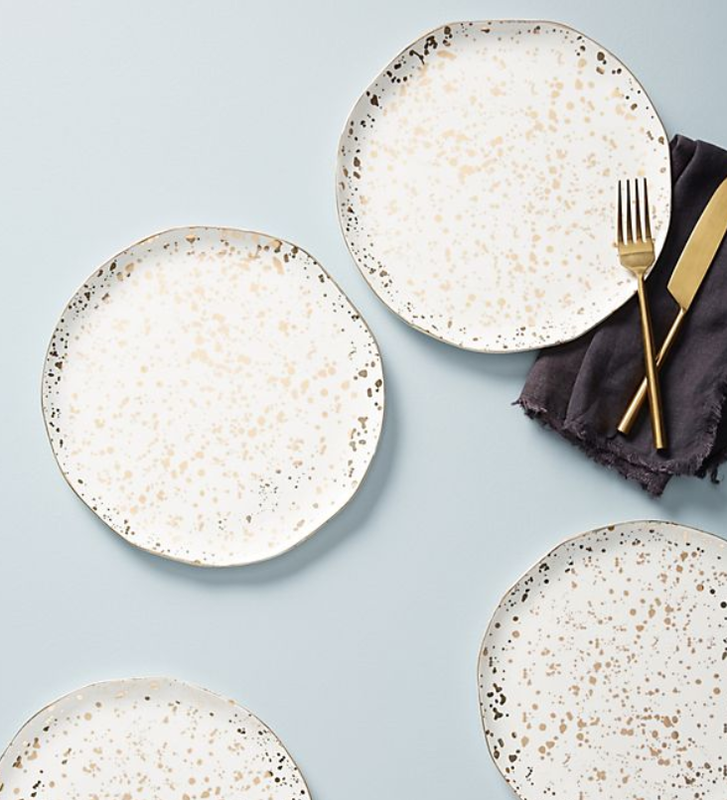 Next, set your plates in place — we love circular plates to add in a visual element and gold-speckled ceramics are even better. For napkins, go simple with something like these frayed-white beauties and we love napkins rings. 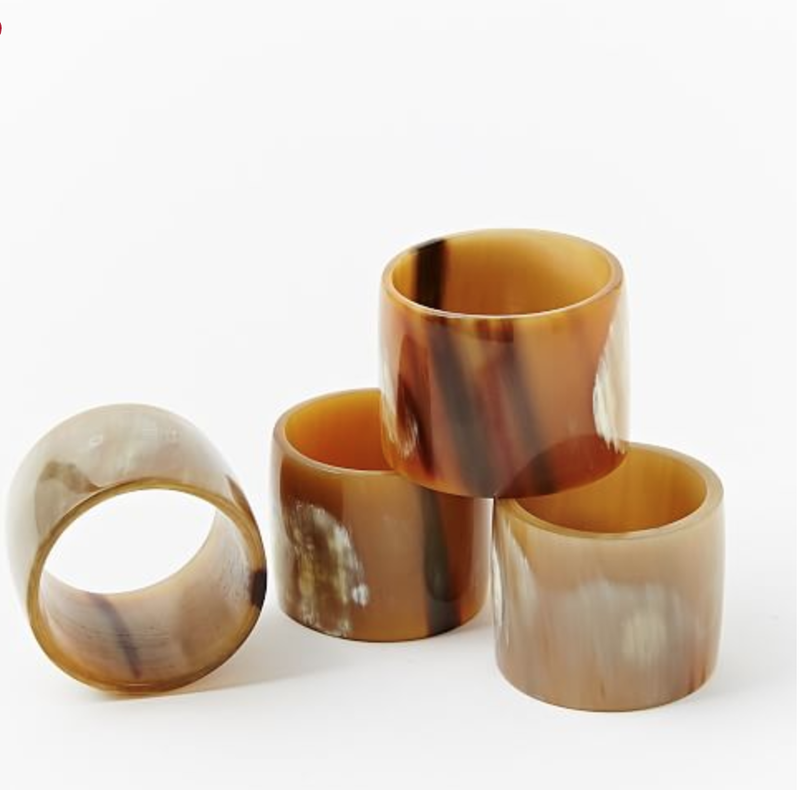 They look fancy but don’t require artistic folding skills (or time!). 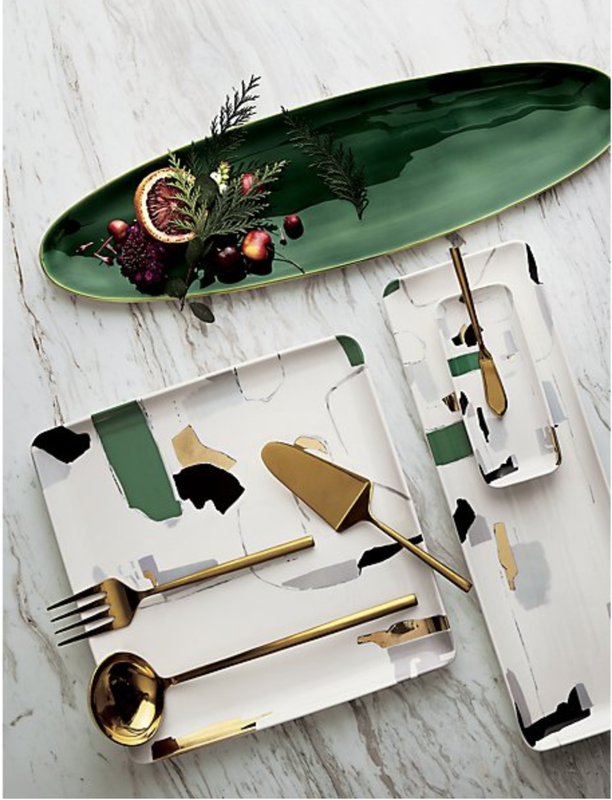 For serving your food, instead of pops of orange — we love the idea of sticking with the natural palette and drawing in some emerald green into the space. 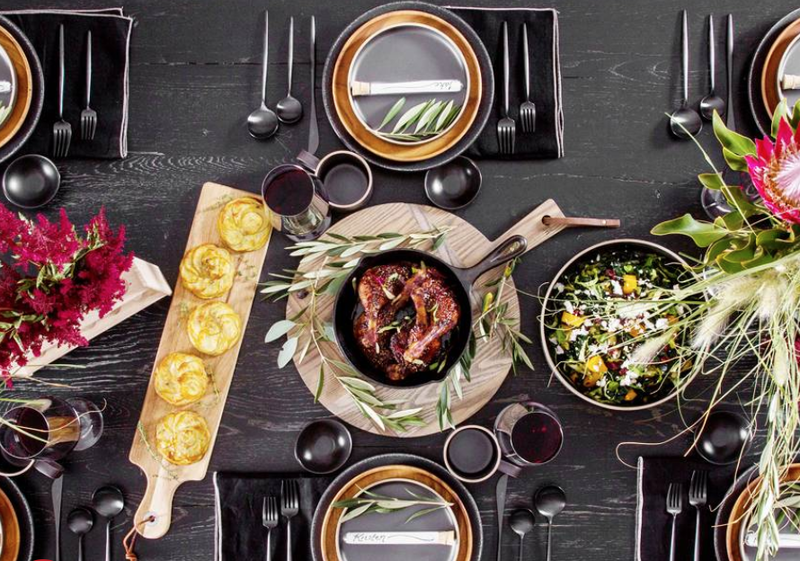 A simple way to make your guests feel loved is to carve out a spot for them. It doesn’t need to be elaborate, but a strip of paper with their handwritten name makes them feel significant. 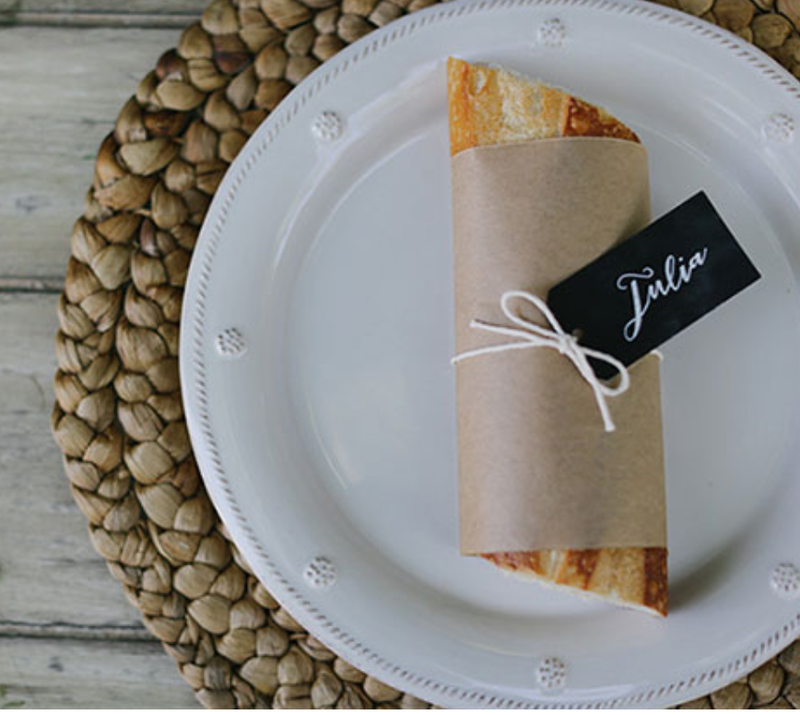 This is another way to incorporate natural elments — set a sprig of thyme or rosemary with their name on their plate, or wrap a slice of bread in kraft paper, tie with twine and tuck in their name card. 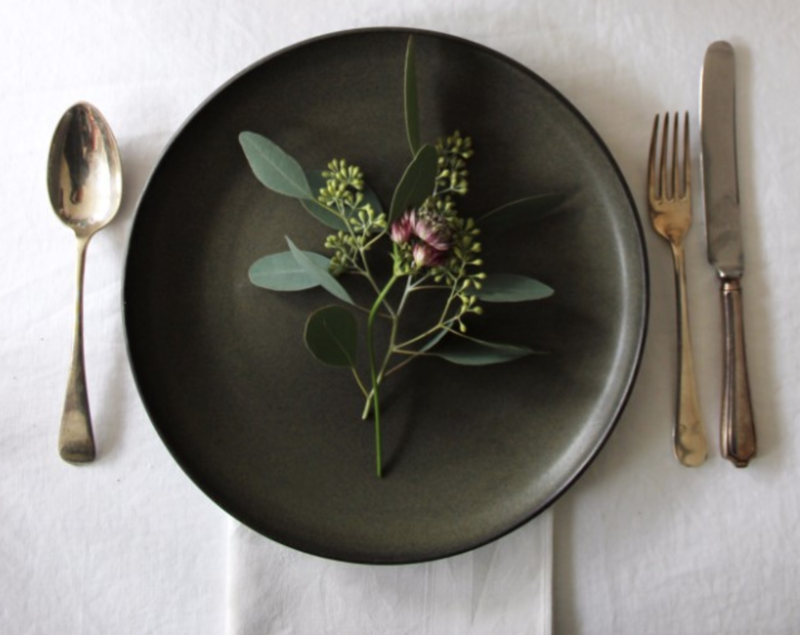 If you don’t have time, simply set a mini-greenery bunch on their plate! Whoever you celebrate with, and whatever the state of your table — keep in mind that simple is best and to enjoy the design process. Let it evolve in unexpected and imperfect ways! Image Sources: Studio McGee and Sean Litchfield via MyDomaine.